MangaHelpers > News > Shout-Outs > Manga Shouts! Bonbonzaka! 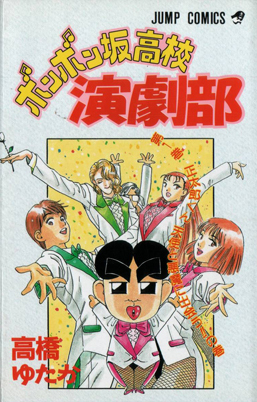 So today, you'll find out more about Bonbonzaka High Drama Club! Translation Status: Currently not translated. Junna Shoutarou, who just entered Tokeizaka high school, falls for the school's madonna, Hibino Makoto. Meanwhile, the school's notorious homosexual, Tokudaiji Hiromi, targets Shoutarou as his new victim. Shoutarou, who under Hiromi's threats, joins the drama club and discovers that Makoto is the drama club's vice president. Perfect--except everyone thinks Shoutarou is gay with Hiromi! The manga was originally posted in the Weekly Shounen Jump, and as a weekly manga it's not incredibly detailed, but for it's setting it does a great job. 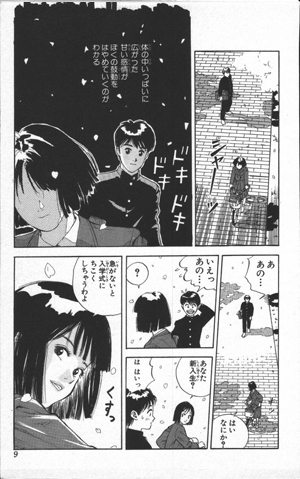 As you can see from the pictures the art has a "shoujo" feel to it, but yet not to the point where typical shounen readers would turn it away. 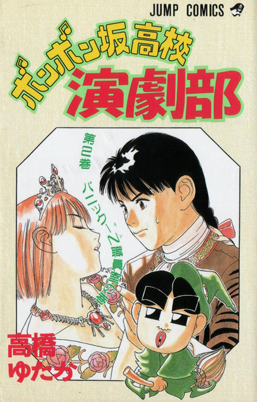 This manga was actually one of the first manga other than Naruto that I wanted to translate. But I never seemed to get past the first chapter. (mainly because there was no interest in it from scanlators >.>) But it was the first series I purchased all the volumes for. The reason why I liked this manga so much is because of the characters. You have your normal student, his crush, and then you have a narcissists who takes it to the extreme. Then you have a fatty that gets thin REALLY fast in order to appeal to the main character, a homosexual that goes through any lengths to try to make him his and then the tension between those two as they try to win Shoutarou over, and well many other characters that just keeps you wanting more. I'd love to see this manga released to the community and wouldn't mind helping / translating it. So please, if there is some interest out there let's see what we can do to get this manga some readers! This manga doesn't have a Shouts Workshop Leader yet! PM NJT and ask him how you can get started!